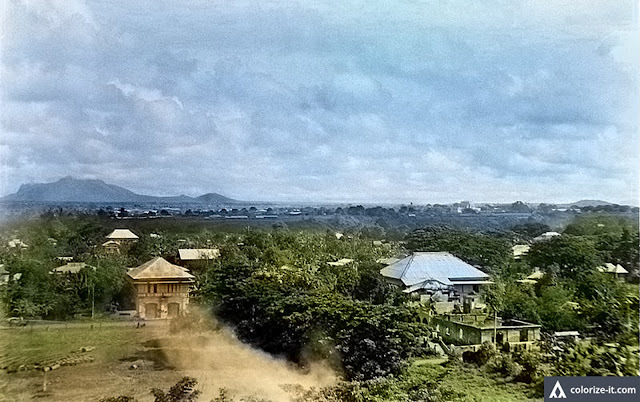 Picture of Batangas town, circa 1945 courtesy of John Tewell. Colorized thanks to Algorithmia. This picture on Batangas History has been modified from the original on Flickr in terms of size (2000 pixels by 1257 pixels) and has been processed using graphics editing software to enhance quality. The license terms allow the public to a) copy and redistribute the material in any medium or format; and b) remix, transform, and build upon the material on the condition that proper attribution is given to the owner and that the picture is used for non-commercial purposes only. The complete Creative Commons license terms may be view here. The black and white version as may be seen in Flickr is show below. The original may be viewed at this Flickr page. The colorized version at top of the page is courtesy of Algorithmia. A photograph of the then-town of Batangas in 1945, courtesy of John Tewell on Flicker. The original is here.